This braided beauty is ideal for weekend and vacation-wear. A summery interpretation of a classic, the sleek design comes with woven leather straps and burnished stud details that add a relaxed finish. 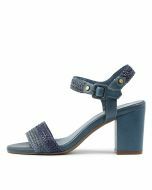 The block heel keeps this sandal modern as well as supportive, making it ideal for nights out or those days when your look needs a lift.